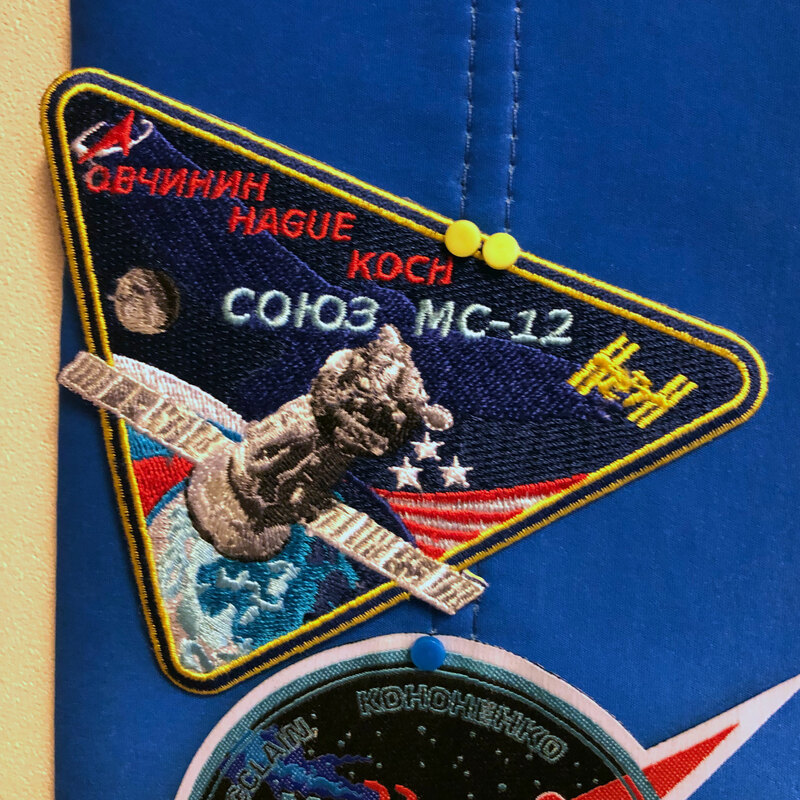 Soyuz MS-12 patch spotted today. Very nice, mostly mirrored, image of the Soyuz MS-10 patch. That's neat and the way they kept the original design concept with a slight change in orientation. Reminds me of the STS-83 and STS-94 patches where they reflew the same crew for 94 and just changed the outer ring color from red to blue. The double border is symbolising their second attempt? I took this photo in Roscosmos on their banner in January. 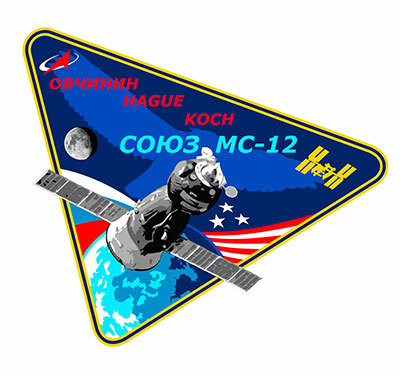 The patch is based on the graphic design for the Soyuz MS-10 crew, composed of Alexei Ovchinin and Nicholas Hague. The composition of the new emblem is mirrored relative to the original one, with the name of Christina Cook added to the design. A double border indicates the second attempt of Ovchinin and Hague to achieve orbit. The triangular shape of the emblem personifies the unity of the three members of the spaceship crew which is shown flying above the Earth. The top corner of the emblem indicates the direction upwards, recalling that the crew is flying from Earth to the International Space Station. Behind our blue planet, Russian and American flags are flying, indicating the international character of the flight. The number of stars in the flag of the United States symbolize the number of crew members. A silhouetted owl in flight, symbol of wisdom, spreading its wings against the blackness of space, symbolizes the contribution to science, the achievements of which are multiplied by research on the ISS. The bright golden silhouette of the space station is visible on the right side of the design - the main objective of the crew’s flight. To the left is the Moon - a daunting task and the goal of future research. The Roscosmos logo is at the top of the emblem, above the astronauts' names. The name of the spacecraft is located in the centre of the design. Are there commercial versions of this patch available (or for that matter for other Soyuz flights)? Not sure what you mean precise, but yes the original Soyuz patches are available to collectors. Congrats,Flying Dutchmen, for your 41st patch on the Soyuz crew space suits. All were into the Soyuz capsule after liftoff. Only one landed from the 44 km altitude after ejection. But according to my information Alexei Ovchinin got back from the capsule the MS-10 panels with the logo and took some with him this time together with the MS-12 panels! Let's wait and see photos. I've not kept track of all the Soyuz/ISS designations. How is the number sequence ordered? Obviously there have been more than 10 or 12 Soyuz flights to ISS. So why is this one designated 12? Thank you. There have been several different models (versions) of the Soyuz to fly crews to the International Space Station since missions began in 2000. The numbering is based on model and order. The ISS program started with Soyuz TM (31-34), then Soyuz TMA (1-22), Soyuz TMA-M (1M-20M) and now Soyuz MS (01-12, at present). MS-12 is the 57th Soyuz spacecraft to dock to the International Space Station (the 58th to launch on a mission aimed there). Where can one (in the U.S.) purchase a Soyuz MS-12 patch? The only retail source for Soyuz flight patches is spacepatches.nl. Contact Jacques for details. Thanks, Robert. I just sent a message to Jacques.